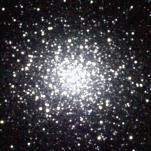 Messier 14 (also known as M14 or NGC 6402) is a globular cluster in the constellation Ophiuchus. It was discovered by Charles Messier in 1764. At a distance of about 30,000 light-years, M14 contains several hundred thousand stars. At an apparent magnitude of +7.6 it can be easily observed with binoculars. Medium-sized telescopes will show some hint of the individual stars of which the brightest is of magnitude +14. The total luminosity of M14 is in the order of 400,000 times that of the Sun corresponding to an absolute magnitude of -9.12. The shape of the cluster is decidedly elongated. M14 is about 100 light-years across. A total of 70 variable stars are known in M14, many of the W Virginis variety common in globular clusters. In 1938, a nova appeared, although this was not discovered until photographic plates from that time were studied in 1964. It is estimated that the nova reached a maximum brightness of magnitude +9.2, over five times brighter than the brightest 'normal' star in the cluster. 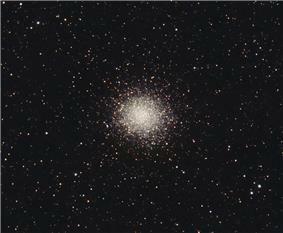 Slightly over 3° southwest of M14 lies the faint globular cluster NGC 6366. ^ a b c d "SIMBAD Astronomical Database". Results for NGC 6402. Retrieved 2006-11-15.